Hunting with Hounds is a vision of 21st century hunting in all its rich diversity. It is the document of one man who has spent the past year photographing hunting with hounds with sensitivity and humour - and occasional warm-hearted mischief. Homer Sykes has turned his camera on representative hunts - fox, deer, hare, mink, rabbit and rat - all quarry that are hunted with hounds. 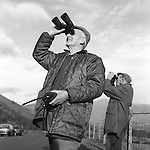 His unusual eye has caught the thrill of the chase, the grandeur of the society hunt, the pride of the rat catcher, the sartorial sense of the cognoscenti, and the everyday essence of hunting as a way of rural life. THE INDEPENDENT NEWSPAPER REVIEW SECTION. March 30 2005. 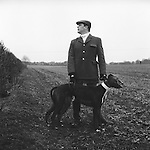 Dominic Prince called Hunting with Hounds "... a beautiful social portrait..."
THE DAILY MAIL. March 26 2005. 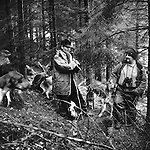 Ian Woolridge called Hunting with Hounds "... a brilliant pictorial evocation of 800 years of the traditional British way of life..."
THE SPECTATOR MAGAZINE	March 19 2005. 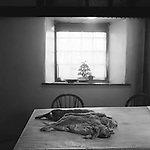 Charles Moore said of Hunting with Hounds " ...these beautiful photographs tell you what it is all about." BLACK AND WHITE MAGAZINE November 2004. Elizabeth Roberts writes " Hunting with Hounds is a remarkable book in many ways. Perceived with humour and not a little wickedness, we see the British - from the landed gentry to the working classes - engaged in a ritual which (whether you approve or not) has been going on for centuries. It's a picture, however that will shortly become history.